Review by Pharos on 6/6/2013. Winter is coming! Is it possible to defend against north of the wall? I didn't see any broken links. I did miss some towns. I agree with the Novirtue that I probably mistook them for bonuses as well. Review by Novirtue on 6/6/2013. Good and fun map, but very hard to see some of the borders, and some of the square towns get mistaken for Bonuses sometimes, other than that though really well done. Review by Срећко on 6/18/2013. Very good map, i like it! I found missing connections in House Lefford between "Tumblestone shore" and "Wendish Town" and in House Martell between "Shandyshore" and "Broken Arm of Dorne". Review by Rathieh on 6/10/2013. Review by KillerBee on 1/10/2014. Such territory. So bonuses. Very Westeros. Much Game of Thrones. Wow. Review by BouncinBettys on 6/7/2013. Review by The Warrior on 12/4/2013. This map is amazing for diplomacy and had borders that really made sense. I really loved this map I would love to see you make the entire lands of "Ice and Fire" with this format. Thank you for an amazing map. Review by Daniel G. Oltmanns on 7/12/2013. Great for any fan of ASOIAF. Towards the end, it becomes too large to easily manage and the bonuses become impossibly large. Personal opinion: start with dorne. Fair defensive position and good bonuses. Review by Karzelek on 7/15/2013. Great map, just a few typos but otherwise quite fun. Review by 魂の神 on 9/24/2013. Awesome would be cool if it could be expanded to cover the over continent? Unless it already has then in that case I WANNA PLAY THAT ONE NEXT!!! Review by Pack_of_platypuses on 9/19/2013. Review by [NL] Pokertje on 7/25/2014. Review by Le Count H on 6/28/2013. Review by Crocell on 2/17/2014. Great map. I love the cities bonuses that can gives you a great advantage quikly. Review by Hurricane on 6/11/2014. Review by Josiah on 12/15/2013. Review by DeezNuts on 9/8/2013. Very good, highly detailed and un-repetitive. However only two good Strongpoints (Neck and Mountain Pass) so not ideal for defensive players. Review by Pax Lucis on 3/4/2014. Review by Robert Murphy on 6/11/2013. Great map. This is perfect for medium FFA games or team environments. Review by Junior Mayrink on 5/28/2014. Review by Bacon Mobster on 6/14/2013. Review by Rev on 10/18/2013. Review by Azor on 12/11/2013. Review by Rocko on 8/19/2013. Review by South Tyrolean on 11/22/2013. Review by Maverique on 9/20/2013. Not as easy as it looks, plenty of little bolt-holes. I enjoyed it. Review by Wayne Wohler on 1/8/2014. like the GOT tie. like the occasional blockage and the bonuses based on cities in a region. Review by Soup1132 on 10/30/2013. Review by Olivier Guillou on 10/5/2013. A very realistic version of the most interessant part of the World of A Song of Ice and Fire ! Review by ErichRey on 2/9/2014. Review by Woody5000 on 11/26/2013. Review by Alexander on 11/28/2013. Very good map. 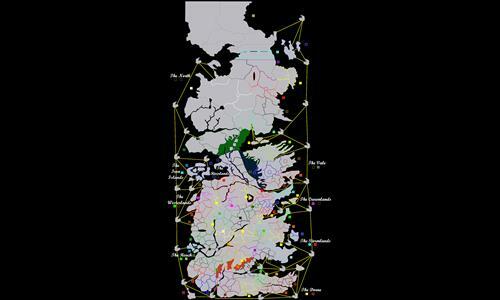 Everything functions properly and the map is a near-flawless representation of A Song of Ice and Fire's Westeros. Review by Doctor Evil on 1/2/2014. Review by pandaegamer on 1/4/2014. Review by otinanaimail on 2/19/2014. Review by angusmac on 11/14/2014. Review by Elliott Best on 2/25/2014. Review by Zooke on 4/24/2014. Review by Koceey on 4/8/2014. Very strategic, very exciting, detailed map. So much fun to play. Definitely my personal favourite. Thank you! Review by Bear on 6/16/2014. Review by rodrickstarkthewanderingwolf on 4/20/2014. Review by Lepinwalrus16 on 5/1/2014. Review by Biurulf on 5/27/2014. Review by McNasty on 5/15/2014. Review by KaWummm on 3/23/2014. Review by OliverApple on 3/10/2014. Review by Daenerys Targaryen on 6/20/2013. Review by Xavier on 7/22/2014. Review by OhThatsRich on 10/28/2014. Awesome map if you are in for an extended game. Review by Adster2525 on 11/13/2014. Pretty fun map. lots of sections. good outer edge keeps the map flowing. First time playing this game was on this map and i enjoyed it. Review by OTPM on 12/11/2014. Review by OfficialResult on 1/11/2015. Review by Decebal Popescu on 1/17/2015. Review by Lentzi on 1/18/2015. Review by nonejake on 3/31/2015. Review by VaporWolf [FROG] on 4/24/2015. The fuller version map is better. Review by Trajan on 11/12/2015. Review by Arvel Crynyd on 6/29/2016. Review by A_B3 on 3/18/2018. Review by DRC on 6/16/2018. Review by Edgaras Kiela on 12/14/2013. Review by DanWL on 9/18/2013. Review by Fastmine on 9/2/2013. Review by mcnuggets on 2/8/2014. Review by Guy Fawke on 2/17/2014. Review by Vigilante1 on 3/11/2014. Review by The Dread Pirate Susan on 10/29/2013. Review by MastaG on 9/12/2013. Review by exe on 9/4/2013. Review by Santiago Ramirez on 7/27/2013. Review by Fidel Castro on 7/6/2013. 0 out of 12 people found this review helpful.